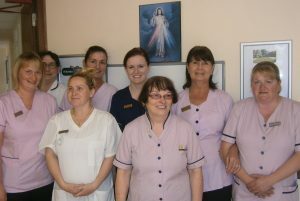 Ballymote Community Nursing Unit has a friendly dedicated team of motivated, trained and vetted, nursing staff, care assistants, pastoral carers, catering, housekeeping, laundry, maintenance and administrative staff. The Unit is managed by Linda Hannon (Director of Nursing) and in Linda’s absence, the Person in Charge is Mary Doddy (Clinical Nurse Manager). It is expected that all communications with our staff is considerate and respectful.